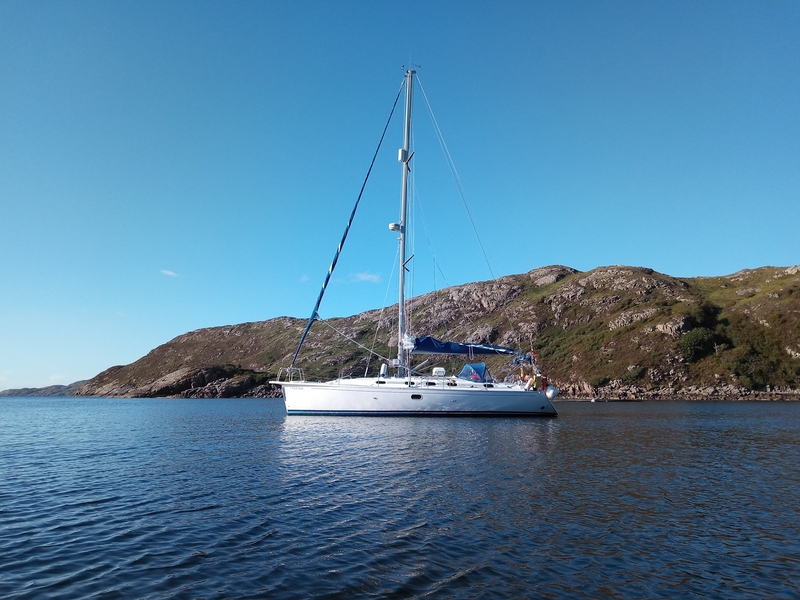 We did our annual yacht charter in our ‘usual’ boat Velella ( from Spirit of June Yacht charters) to our old haunts around the Minch. 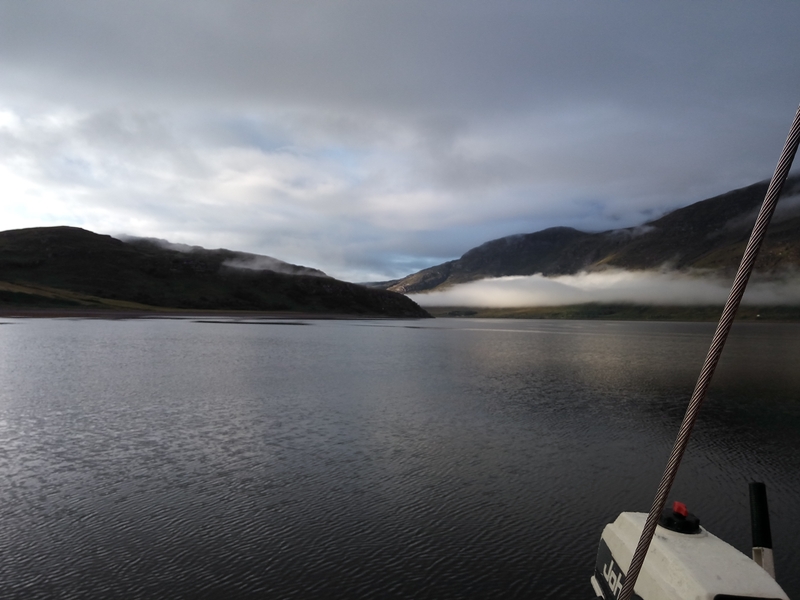 We had hoped to go through the Sound of Harris and then try to get out to St Kilda, which is about 40 miles out into the Atlantic, but the anchorage there is not brilliant, so it requires a settled weather window to make the trip and we had just missed one. We did try to go but there was an unsettled forecast and when we went through we realised that the seas on the West coast can be much more inhospitable in windy weather than in the Minch , so we took the prudent option and came back! The East coast of Harris and Lewis is a wonderful cruising ground and we explored some new places before scurrying into Stornoway to disembark one crew member and shelter from the only gale we had. We have now learnt that if we are in Stornoway for bad weather its very cheap ( £35 inc from 4 pm on Saturday to 9 a.m on Monday) to hire a small car and see the island. 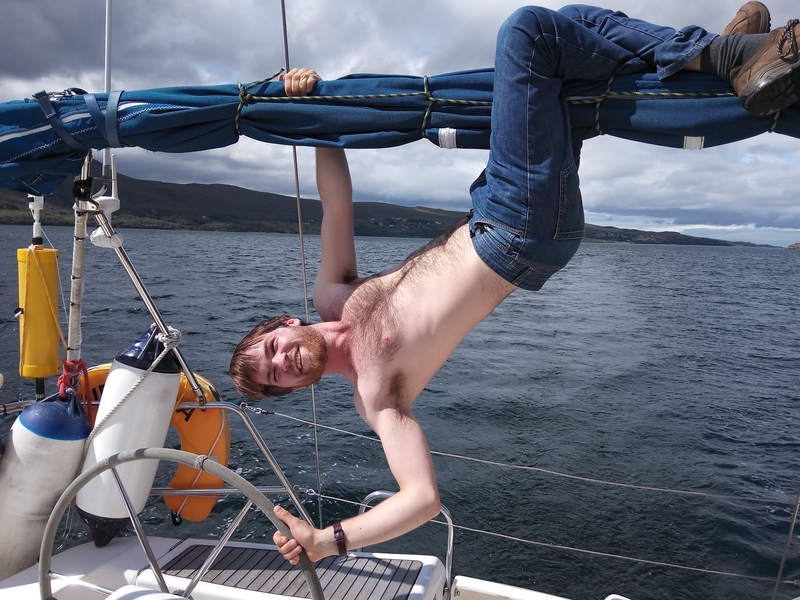 After Stornoway we had a super sail over to the mainland and found a lovely anchorage in Enard’s bay – Loch Saliann. 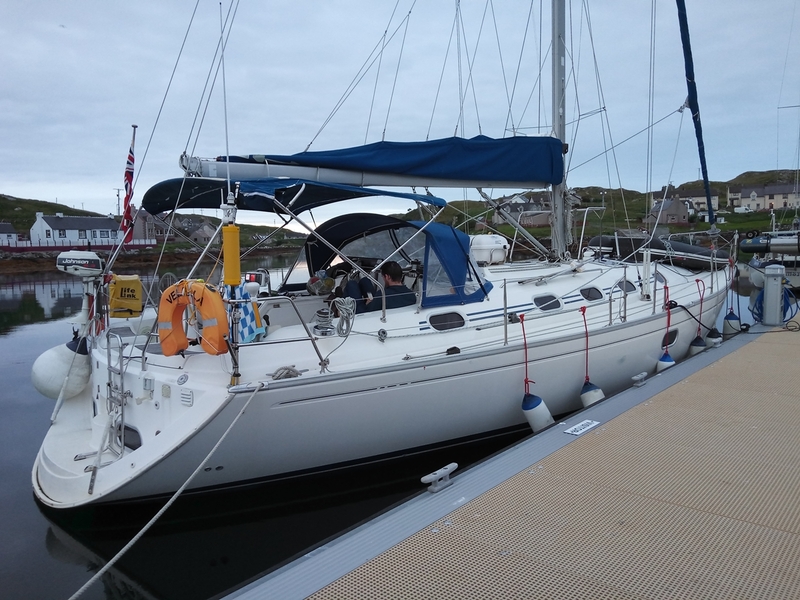 We stayed one night in Lochinver on a pontoon – not a great destination but its mainly a fishing port. Good places we liked – Loch Restol, Harris, although we had to leave very early as its only accessible near the top of the tide. The top of Loch Seaforth, Harris/Lewis was peaceful although we did have another yacht anchored half a mile away, which counts for crowded in those parts! Loch Shell (Lewis) is a favourite, although we found the holding at the head of the Loch a bit soft and moved to a bay on the South side opposite the inlet with houses. Our trip was unusual in that, gale apart, almost all evenings, nights and mornings were calm, and we never once had a disturbed night, or the need to get up to check the anchor was holding. Although it wasn’t particularly hot in the first week (the cabin heater got used in the evenings), and it did rain a bit, we had a fair number of meals in the cockpit, and it was voted our best Hebridean holiday yet. If you go sailing in this area, you will no doubt listen carefully to the (Met Office) Inshore weather forecasts from the Stornoway Coastguards on VHF. Our experience is that if you take the wind forecasts too literally you tend to be over cautious and don’t go anywhere – The really useful information is the sea state as that has a bigger impact on what its going to be like sailing. I find that using the Windguru website ( when you can get mobile coverage, which is more often than you would think) gives a better and more detailed wind picture – the Inshore forecast only seems to give the top gust speeds as the wind speed, whereas Windguru lets you see both steady wind and gusts, which is a much better guide to what the sea will be like. Having said that, we do take notice of gale warnings from whatever source! Facilities continue to improve in the North West of Scotland and the Isles – since we were last there new pontoons have been built at Scalpay North Harbour and East Tarbet ( both lots of space), and the number of pontoon berths in Stornoway has been increased, although they were pretty nearly all taken when we came in for the gale. In spite of that, its still rare to find other boats in the quiet anchorages, although the visitor moorings that are sometimes provided do get a few visitors. The leisure boats around are a mixture of foreign boats – mostly French Dutch or German with the occasional American boat, with some visiting boats from England and a fair number of local boats, with of course a few charter boats like us! In fact, although we saw a number of yachts about, it was mostly the same two or three doing roughly what we were doing. If you like solitude, go soon as it is getting more visiting and locally based yachts each year! Loch Sailinn, Enard’s bay, Sutherland – a bit south of Lochinver. 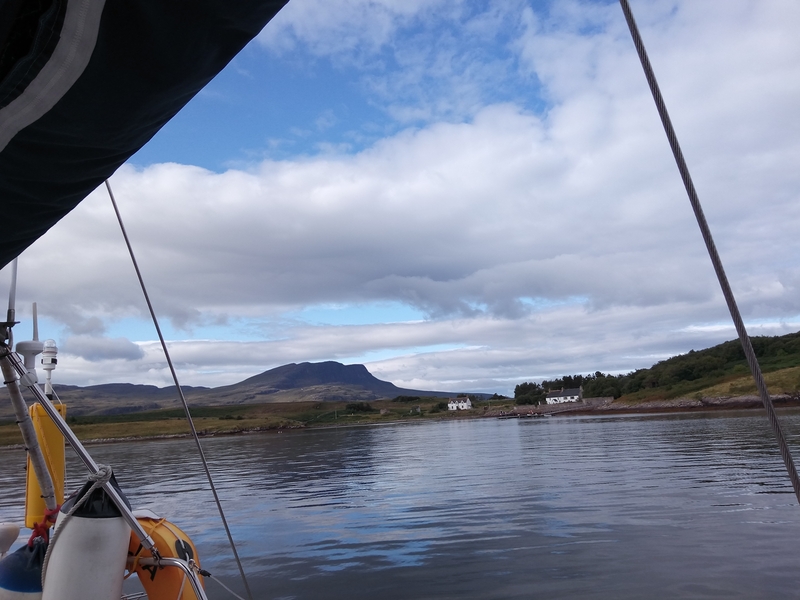 Head of Little Loch Broom – a quite anchorage although not particularly well sheltered. Velella alongside in Scalpay, Harris – there is water and electricity and there will be WiFi soon, we were told. 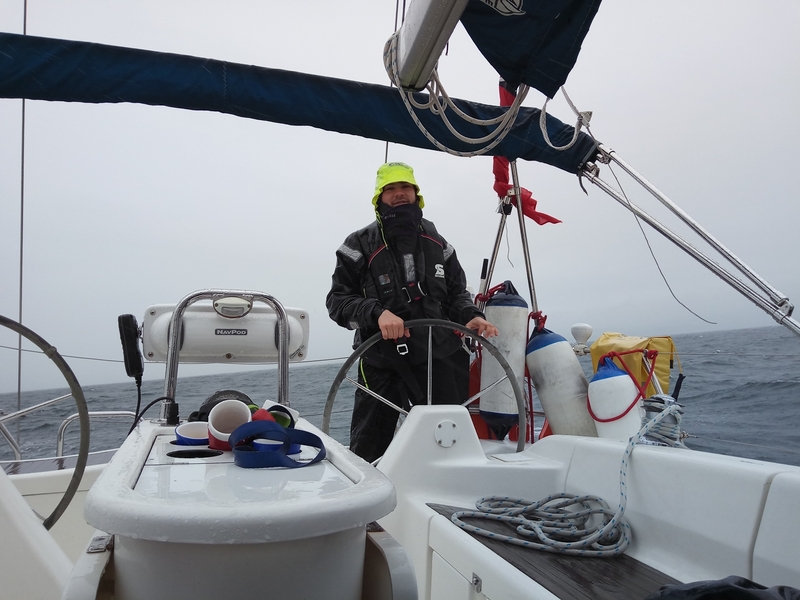 One way to steer – proof that sailing drives you mad?……..
Not every day was sunny and dry – many were damp in patches – notice the lifejacket – Giles had been working on deck.